WASHINGTON, Feb. 2, 2019 – Taylor Farms TX, Inc., a Dallas, Texas establishment, is recalling approximately 2,100 pounds of chicken products that were incorrectly labeled as “Chile Relleno” products due to misbranding and undeclared allergens, the U.S. Department of Agriculture’s Food Safety and Inspection Service (FSIS) announced today. The products contain wheat, a known allergen, which is not declared on the product label. The 10-oz tray packages labeled as “HEB-MEAL SIMPLE CHILE RELLENO” with “USE BY” dates of 02/04/2019, 02/05/2019, 02/07/2019, 02/08/2019, and 02/09/2019 and lot codes TFD025AU4, TFD026AU4, TFD028AU4, TFD029AU4 and TFD030AU4. 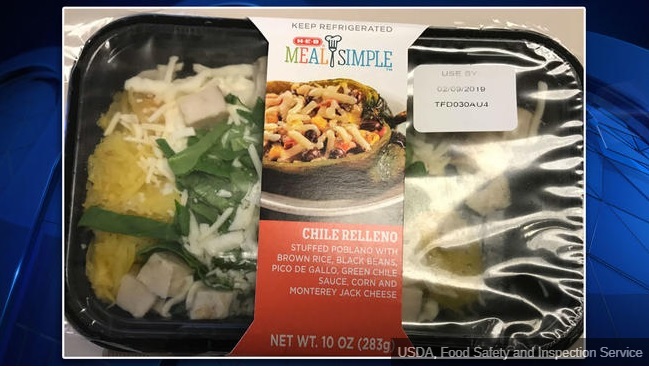 The problem was discovered on Feb. 1, 2019, when the firm found that a label for “Chile Relleno” was incorrectly applied to some of its USDA’s amenable “HEB Roasted Spaghetti Squash with Alfredo & Chicken” products. FSIS routinely conducts recall effectiveness checks to verify that recalling firms are notifying their customers of the recall and that actions are being taken to make sure that the product is no longer available to consumers. When possible, the retail distribution list(s) will be posted on the FSIS website at www.fsis.usda.gov/recalls. Consumers with food safety questions can “Ask Karen,” the FSIS virtual representative available 24 hours a day at AskKaren.gov or via smartphone at m.askkaren.gov. The toll-free USDA Meat and Poultry Hotline 1-888-MPHotline (1-888-674-6854) is available in English and Spanish and can be reached from 10 a.m. to 6 p.m. (Eastern Time) Monday through Friday. Recorded food safety messages are available 24 hours a day. The online Electronic Consumer Complaint Monitoring System can be accessed 24 hours a day at http://www.fsis.usda.gov/reportproblem.